We have previously demonstrated (J. Neuropath. Exp. Neurol. 48:1–10, 1989) that the pathogenesis of methylmercury (MeHg) induced cytotoxicity in suspensions of cerebellar granule neurons was not strictly coupled to the reduction of ATP or combined inhibition of ATP or macromolecule synthesis, but suggested a component of free-radical injury. The present studies reveal that MeHg initiates a dose- and time-dependent lipoperoxidation measured as malonaldehyde generation or induction of a 2′,7′-dichlorofluorescein (DCFA) signal representing oxygen radical species generation. A simultaneous decline in GSH occurred. Partial protection was given by EGTA (a Ca2+ chelator) or desferoxamine (Fe2+ chelation with inhibition of the Fenton reaction and OH radical production). However, no cytoprotection was found with alpha-tocopherol succinate although significant inhibition of lipoperoxidation was observed. Analogous experiments in cerebellar granule cell culture revealed a dose-dependent (0.5–μM) increase in the specific activity of GSH accompanied by increased lipoperoxidation and neuronal cell injury. Such paradoxical induction of GSH occurred in glial cells, whose endogenous content was higher than that of neuron culture. Inhibition of gamma-glutamyl cysteine synthetase by buthionine sulfoximine (BSO) lowered cellular GSH and strongly potentiated MeHg-induced lipoperoxidation and cell death in neuron culture but had minimal effect in glial culture. 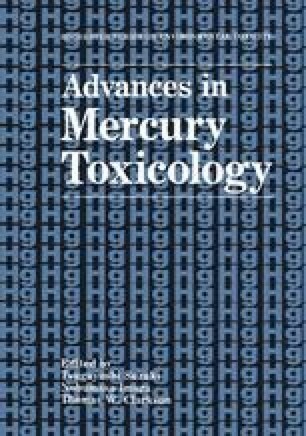 It is likely that activated oxygen species and lipoperoxidation significantly contribute to the pathogenesis of alkylmercury induced injury but are not singly causal to the final cytotoxic event. Other processes, especially intracellular protein degradation of -SH sensitive proteins or permeases, modification of cytoskeletal proteins, activation of phospholipase A2 and activation of protein kinase C contribute to the final lethal event.